When Yang Gui Fei's attack brings someone to the brink of death, the target cannot use a heart peach to save them self. 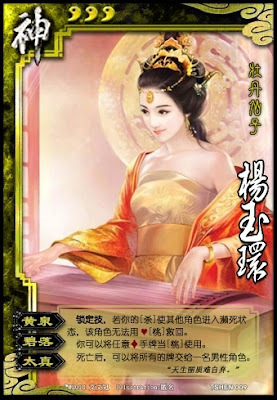 Yang Gui Fei can use any diamond hand card as a peach. When Yang Gui Fei dies, she can give all her cards to one male player. When Yang Gui Fei brings someone to the brink of death, they can still use diamond peaches. "Hades" does not prevent other players from using a heart peach to save the player as well.